Our guide to the best guns in COD Blackout. Our COD Blackout best guns guide details the best pistols, best SMGs, best shotguns, best assault rifles and best sniper rifles in the game. If you're into FPS games at all (or even if you aren't), then chances are you'll be familiar with Call of Duty. It's a franchise that's spawned countless titles to the point where it's become somewhat of a household name in the videogame industry. Similarly, the inception of PUBG and the staggering success of Fortnite's Battle Royale (BR) mode opened the floodgates for a new wave of BR spin-offs and IPs. So it comes as no surprise that Call of Duty has jumped on the bandwagon and created its own take on the BR genre with "Blackout". Makes sense though, as pairing up the multiplayer tension of BR with COD's impeccable gunplay and polished mechanics makes for one of the best BR experiences yet. Wingsuit into a few games of Blackout and it becomes immediately obvious that there's a whole host of different weapons to choose from. While it's great to have such a fine selection, you're only able to practice with a limited arsenal per match, which makes it a lengthy process identifying which weapons are ludicrously overpowered or particularly easy to use. For those of you unfamiliar with the game, or those who still aren’t sure what’s considered a strong weapon in Blackout, we’ve put together a guide that’ll take you through those guns that we consider to be the very best. 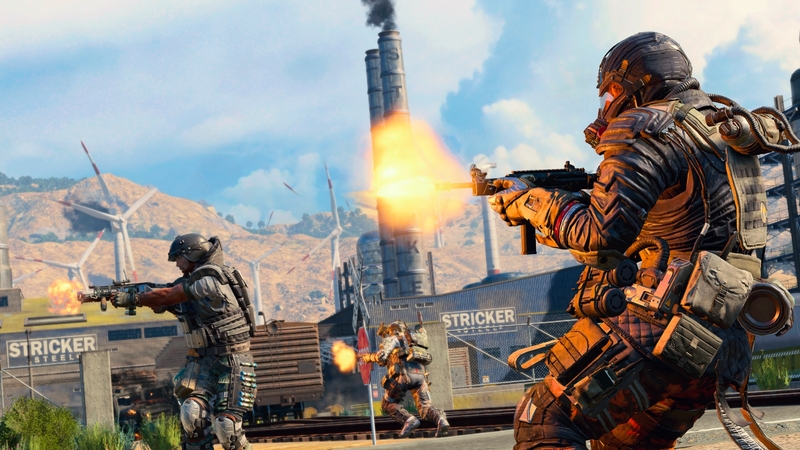 It’s worth quickly mentioning that Blackout’s likely to receive more weapons as time goes by and we’ll endeavour to keep this guide updated with all the latest and greatest in the armory. Here's our list of the strongest weapons we've come across so far. We'll continue updating and tweaking this page as time goes by, so keep your eyes peeled for further changes in the near future! Easily the best Assault Rifle in Black Ops 4's multiplayer modes, and this translates to Blackout as well. While many other Assault Rifles in this list have a bit of shudder or kick (as you'd expect), the VAPR-XKG feels like a laser beam when you pull the trigger. There's barely any recoil which makes this remarkably easy to use. Couple this with decent damage stats and a fast fire rate, and you've got yourself a winner. A more common drop than the other Assault Rifles on the list, but this doesn't make it any less powerful. It's essentially Blackout's version of the AK-47 which means it packs a punch and won't let you down when it comes to accuracy too. Another great all-rounder. This assault rifle is another option you shouldn't pass up. It's compact in hand, surprisingly weighty when fired and has just a touch more kick than the VAPR. Long range isn't a strong point, but it hits very hard in short to mid-range engagements. Blackout’s version of the popular AUG assault rifle, this is remarkably similar to the Swordfish (another AR) in both form and function. Tap the trigger and you’ll fire off a three round burst that’s surprisingly strong. A brilliant tool for taking out enemies at mid to long-range. A big favourite of ours. It’s got an insane fire rate and high damage output, making it deadly at close range. Things start getting trickier when tackling enemies from afar, so we’d recommend switching out to something else if you spot someone in the distance. A fantastic alternative to the Spitfire. It's not quite packing the same high fire rate, but it's by no means a slouch either. What you've got here is a steady all-rounder of an SMG that'll go nicely with your primary weapon and is more than capable of downing an enemy or two at close range. There are only two shotguns in the game currently, but this one trumps the pump-action MOG 12 as it's fully automatic. This means you're able to pull down the trigger and pepper enemies at close range without the inconvenience of reloading between every shot. The beefiest sniper rifle in Blackout and one that's certainly been adopted as one of the favourites so far. It's all down to the sheer power of its 50.cal bullets and the surprising ease at which it'll return to position once it's fired off a booming shot. Plant a round in someone's head and you can be sure they won't see the light of day again. Not quite as powerful as the Paladin, but it has such a fast fire rate that it almost belongs in the DMR category. This makes it a fantastic option for more frantic mid-range fights where you've got less time to line up a shot. A big ol' LMG with an enormous clip and huge damage potential. Despite it's cumbersome weight and lengthy reload time, this thing's a monster when it comes to holding down the trigger and shredding multiple health bars in one clip. Just don't go spraying too long as it's easy quite easy to lose control! A rocket launcher that's able to lock onto vehicles. While it's not quite as potent in Solos, this weapon comes into its own in Duos or Quads where players are more likely to be grouped up in helicopers and trucks. There's nothing more satisfying than watching a rocket sail into a chopper as it desperately attempts to swerve out of the way.